On May 29 water started flowing through the spillway at Attabad. The photo here, from Dave's Landslide blog, shows an early stage of the overtopping. 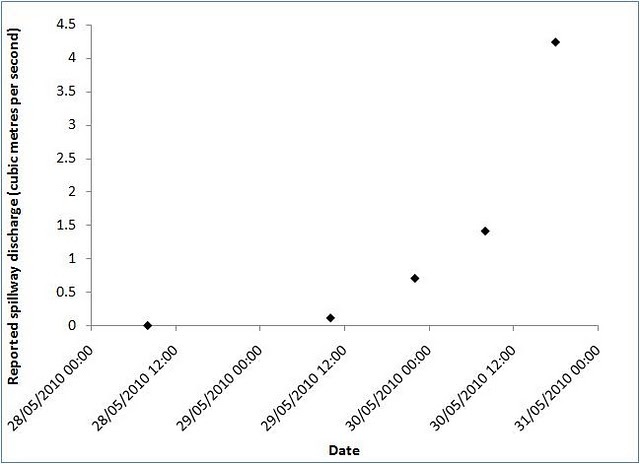 The spillway is working well at these low discharges. There were some reports of landslides into the lake today, and estimates that these slides had increased the lake level by 2 feet, but I don't know if these have been verified. As of this a.m. the discharge through the spillway is estimated to be 4 cusecs (cubic meters per second). The lake level is rising about 2.5 cm per hour, and inflow into the lake is estimated to be 71 cusecs. There is thus about a 7 cusec difference between inflow and outflow. This water is stored in the lake causing its level to rise. As it rises, the discharge through the spillway increases. One limiting case is that the spillway channel will stay at the current width, in which case the increase in discharge is directly proportional to the rate at which the lake level rises and increases the depth of the water flowing through the spillway channel. At the other extreme, if the spillway erodes and widens, then the discharge will increase as both the area increases and the depth increases. Erosion at the bottom of the channel would increase the depth of the flow through the spillway even further. 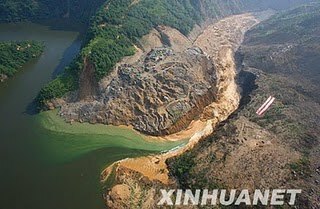 It is this later case that worries the landslide experts because the discharge could increase so rapidly under these conditions. Dave is updating his blog frequently, so tune in there rather than here! Tungurahua volcano, Ecuador, closes Guayaquil Airport! The second airport in two days has been closed by a volcanic eruption. Tungurahua volcano began erupting yesterday, closing the Guayaquil Airport until at least this afternoon. I was in Guayaquil about 10 years ago on my way to the Galapagos and found it to be a very pleasant and undiscovered seaport town. 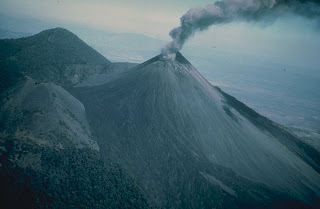 According to CNN, Pacaya Volcano, 15 miles south of Guatemala City, began erupting at 9:00 p.m. ET on Thursday, May 27. Two villagers and a reporter from a CNN affiliate were killed in the initial eruption, crushed by rocks spewed from the volcano. 1800 people have been evacuated, and the airport in Guatemala City is closed as of Friday. Pacaya was dormant for a century until 1965, and has been active since then. The government has declared a 15 day state of emergency. Pacaya is a young volcano, dated back to 23,000 years. It lies on the edge of an older larger caldera formed at least 300,000 years ago. It has erupted at least 23 times since the Spanish colonization in the 15th century. It is one of the many Central American volcanoes associated with the subduction of the Cocos Plate beneath the Caribbean Plate. According to the Icelandic Meteorological Office, the activity at Eyjafjallajokull has diminished in a number of significant ways, although it is not clear whether this is "the end" or just a lull. The plume is "only" 10,000 feet high and is composed of steam only. There are no reports of ashfall, and no lightning strikes have been detected (lightning strikes indicate significant ash concentration). Meltwater from ice surrounding the volcano is small, temperatures from a heat camera are "almost 100 C". Volcanic tremor is decreasing to levels prior to the eruption, except in the frequency band 1-2 Hz which may be due to rising steam. I published a paper ages ago regarding seismicity of a very similar nature at Old Faithful, see Figure 1, reproduced here. 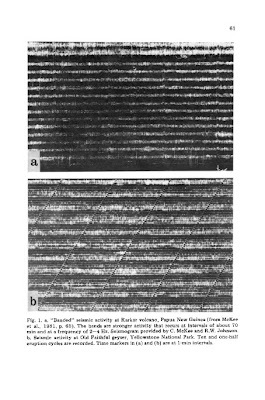 It had been noted by scientists studying Karkar Volcano in Indonesia that there was banded harmonic tremor that suggested underground geyser eruptions, and the similarity of the two seismograms (Karkar and Old Faithful) is amazing. You can get a higher resolution look at the figure by clicking on it, but it's not a high-quality image to start with! 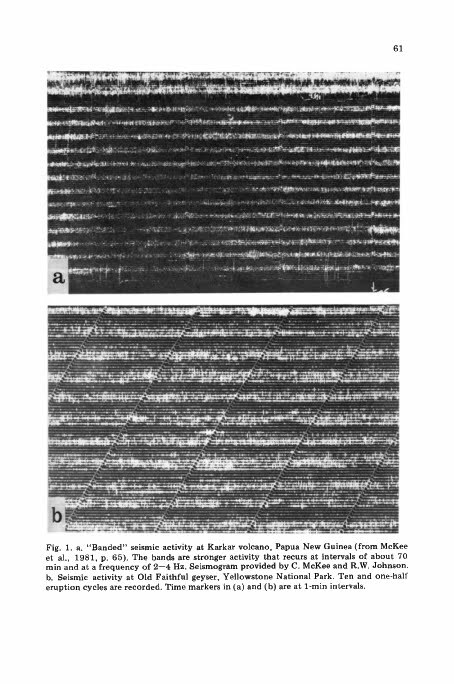 I look fondly at the low-quality reproduction of the seismic record (it isn't much better in the pdf of the original article). 1984--before PDF, WWW, and low-quality scanning to make the PDF. Young(er) geophysicists will be laughing--this seismogram was obtained by the now-lost-art of smoked drum seismographs. The art is to take the drum off the case, wrap it in special white paper, and then hold and rotate it over a smoking kerosene lamp. Since I had to do all of my seismic work in Yellowstone during the winter in 1976 (approximately when this record was obtained), we did all of the smoking in an unheated garage in Yellowstone. Kudos to my colleagues at the time, Rick Hutchinson (now deceased) and Gonzalo Mendoza! 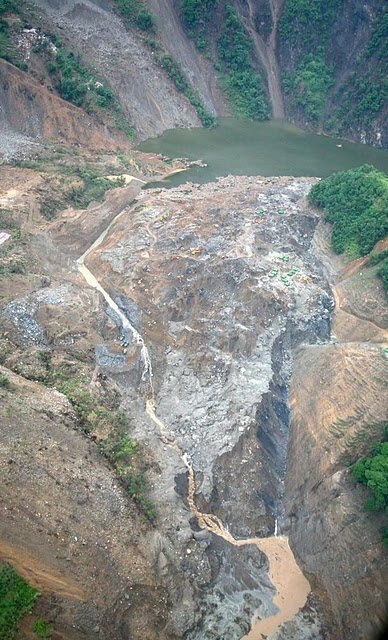 Before and after photos of the erosion of a landslide dam. Photos from Dave's Landslide Blog, but not sure where he first got them. He compares the current situation at Attabad with a similar situation that he monitored at Tangjiashan, China, two years ago. (Here's a direct link to his posting on that at a comparable time before breaching. Read forward and backward to see the whole history.) 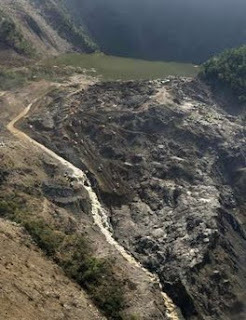 For those who want material for teaching, this is a great example of what the failure of a landslide dam looks like. The dam was formed in 2008 by the Sichuan earthquake. In this case, the spillway was engineered to start eroding when the lake overtopped and started flowing through it. It was not as steep as the Attabad spillway (this is good), but was also too narrow. Five hours after flow started, the dam failed, but the engineering solution had worked fairly well, and Dave is hopeful that the outcome at Attabad will be like this, rather than more catastrophic. Unfortunately, the dam at Attabad is narrower, and so it will be more prone to fail entirely instead of just along the spillway axis. It is also composed of smaller particles than the Tangjiashan dam and will therefore be more erodible. I have not been able to find out details of evacuations and preparations downstream. Some information is contained on Dave's WWW site in earlier postings. Photo of the platform Deep Water Horizon by U.S. Coast Guard. 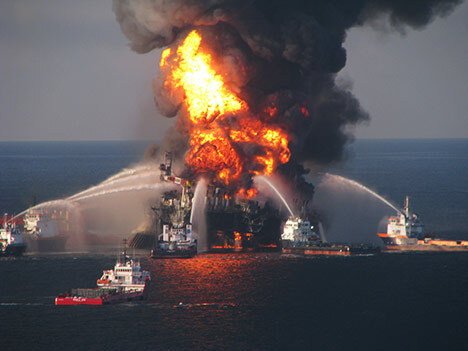 BP has released a streaming video of the source of the oil spill in the Gulf of Mexico. Apparently the position of the camera will be changed sometimes so it should be an interesting video to follow. Striking aspects of the plume are the unsteadiness of the flow, the existence at times of two streams (a light stream, presumably methane gas, and a darker stream, presumably the oil), the turbulence, and the spiraling rotation of the plume. Prof. Steve Werely at Purdue claimed to the Senate last week that he had used PIV to obtain the discharge rate of oil into the Gulf. PIV tracks individual fluid packets in order to estimate velocities. I do not have access to his velocities, but only to his conclusions. He claims that there are 70,000 barrels per day (3.9 million gallons per day), a value way in excess of the 5,000 barrels per day that BP and the US government have been using. He claims that 25,000 barrels per day are coming out of a 1.2" wide pipe. There are apparently 3 sources of oil, but I've not been able to find the details of the geometry. I did some calculations that show that the velocity would be about 1.5 meters per second. This seems like a reasonable velocity to me from the videos that I've been able to see. The SEB is composed primarily of ammonia ice. One theory is that the belts of Jupiter are lower levels of the atmosphere revealed by gaps in the higher paler clouds. If this is true, then one possibility for the disappearance of the SEB is that it is simply obscured by higher level clouds that have returned to this latitude. The reappearance of the SEB will occur in perhaps the next year or two, and the event is predicted to be dramatic. Historically it is accompanied by planet-wide outbreaks of violent storms at the latitude of the SEB. One of my favorite blogs is "Dave's Landslide Blog". 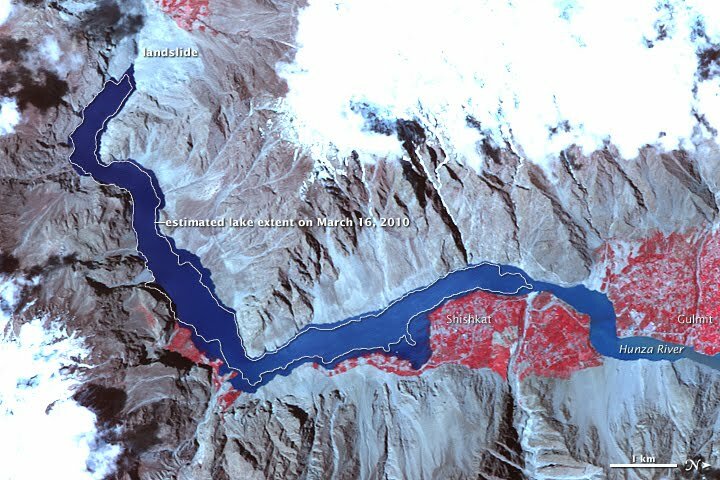 For the past four months he has been regularly tracking the buildup of a large lake behind a dam formed by a landslide that blocked the Hunza River in Northern Pakistan. The lake will be overtopping the dam within a few days (possibly as early as tomorrow). This landslide, called the Attabad landslide, occurred in early January, killed 14 people, inundated several villages and stranded about 25,000 people. More than 50,000 people could be affected by failure of the dam. As of today, it is estimated that there are only 2-3 meters of freeboard before water starts flowing through the spillway that has been engineered through the dam. A glacial lake outburst flood on May 17 raised the water suddenly by 2 meters. All construction on the spillway has ceased due to the imminent breach. Dave's opinion is that the spillway that has been carved is too small to to accomodate the spring runoff flow of the Hunza River. Seepage through the dam has been ongoing, and one possibility is that the dam will fail because of the seepage. Another possibility is that another landslide will initiate overtopping. A third is that water will flow through the spillway with possible erosion. Most people in this region are farmers whose only assets are their buildings, their land and their crops. They have been tearing apart their buildings to preserve the construction materials, and are in danger of losing their land and crops. It is a terrible tragedy of which most of the world is unaware. Mount Pinatubo erupted in 1991. 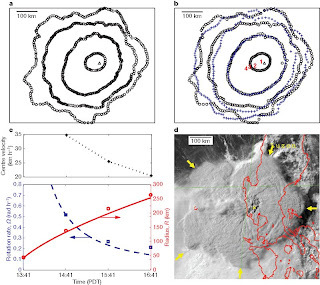 Nearly 20 years later, scientists made careful measurements of the position of the top of the eruption column, the "umbrella", and noted that it rotated (see Chakraborty, P., Gioia, G., and Kieffer, S., Volcanic Mesocyclones, Nature, 458, 497-500, 2010). The rotation induced an instability manifested as waves or lobes on the edge of the umbrella, as shown in the attached figure (from the Nature paper). The image shows a satellite view of the umbrella of Pinatubo. The graph shows rotation rate and growth rate of the umbrella. The two sketches above show the outline of the edge at different times as documented by satellite photos, and the graphs in the lower left show measured rotation rates. Details are in the Nature paper. By analogy with meteorologic cyclones, Chakraborty et al. called the eruption plume a "volcanic mesocyclone". Three key elements interact to produce tornadic structures such as dust devils and waterspouts: updraft in the center, downdraughts, and the rotating mesocyclone. Chakraborty et al. proposed that the mesocyclone pulls the ash radially outwards from the core of the updraught, gathering it in an outer sheath where it discharges to produce the spectacular lightning displays that can accompany volcanic eruptions. 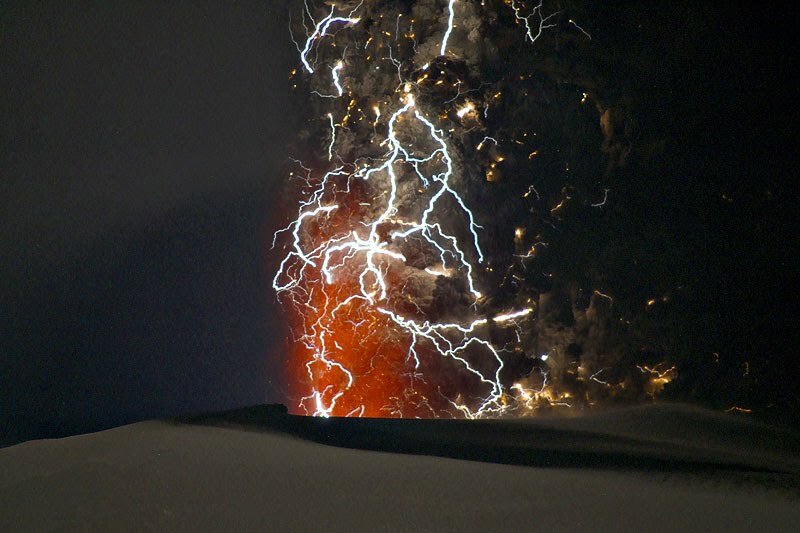 The color image shows such lightning in the current eruption of Eyjafjallajokull in Iceland. It was taken by Marco Fulle. 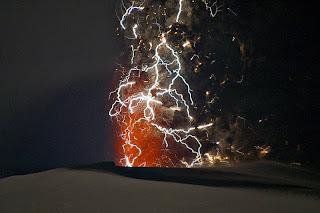 The other image shows (a) waterspouts spawned during the eruption of Surtsey volcano on November 14, 1963, and (b) the lightning sheath from Mount Chaiten on May 3, 2008. 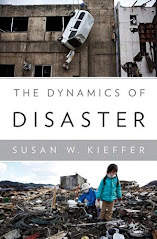 Contact me at s1kieffer@gmail.com if you would like a PDF of the Nature paper.